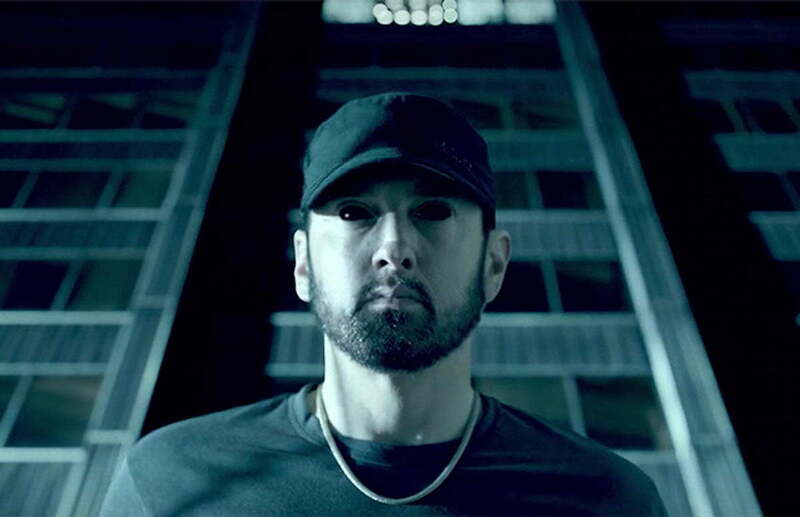 Eminem is in full Kamikaze mode after dropping his surprised album on us like a bomb last weekend. The album saw Slim Shady taking on his critics which includes rappers and radio personalities like DJ Akademiks and his former friend turn foe, Joe Budden. “Somebody tell Budden before I snap, he better fasten it / Or have his body bag get zipped / The closest thing he’s had to hits is smackin’ b**ches / And don’t make me have to give it back to Akademiks,” Em raps. The video for “Fall” starts with Eminem riding shotgun in a Dodge Challenger with Royce Da 5’9″ driving. Em became uneasy when he was getting alerts on his iPhone about articles being written about how bad his last album Revival was. Eminem then dropped the phone and walked into a building. While walking, he passed two internet trolls reading an article about him and then they got possessed by a demon that came out of the iPad and started chasing the rapper. After successfully outrunning the internet demon, Em was finally cornered, and that’s when he too got possessed and turned into the ultimate demon/troll.